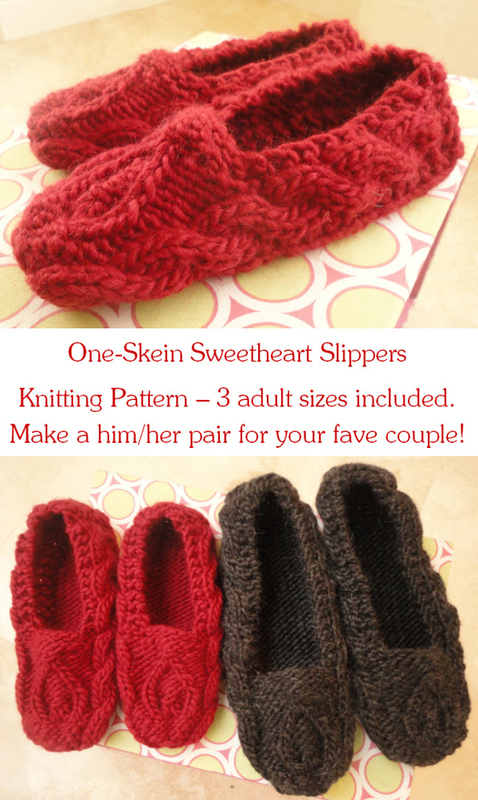 Warm their feet and hearts with these beautiful, quick knit slippers! Knit in one piece, each slipper starts at the back heel and works its way forward with nice cables along the sides. Then, the stitches are joined in the round and finished on DPNs. A super sweet twisted stitch heart decorates the top of each slipper. Minor seaming at the back heel and that's it! Plus, only one skein of yarn needed (assuming you reuse the gauge swatch yarn for size L). Makes a great gift idea for Valentine's or just anytime. Finished Knit Measurements: Approx 8 ½ (9 ¼, 10 ½)" [21.5 (23.5, 26.5) cm] length measured along bottom sole UNSTRETCHED. TO FIT: Unisex sizes S (M, L) to fit approx foot lengths 8 ¾ - 9 ½ (9 ½ - 10 ¾, 10 ¾ - 12)" or approx Women's U.S. shoe sizes 5.5 - 8 (8 - 11.5, 12) or approx Men's U.S. shoe sizes 6 - 6.5 (6.5 - 10.5, 10.5 - 14). This fit is based on using the Brown Sheep Lamb's Pride Bulky yarn. A different yarn will stretch differently and may not accommodate the same sizes. Yarn Used: Brown Sheep Company Lamb's Pride Bulky (15% Mohair/85% Wool); 4 oz/113 g [125yds/114m] skeins: 1 (1, 2*) skein(s) in Raspberry M-83. * For Size L, sample (in grey in top photo) was made with exactly 1 skein of yarn, with less than 1 yard of yarn leftover. If you reuse gauge swatch yarn, don't waste any yarn, and have exact gauge, you should be able to use just 1 skein. Pattern Gauge: 12 sts = 4" [10 cm] and 20 rows = 4" [10 cm] in St st.
Yarn Label Gauge and Information: A bulky weight yarn in a soft wool/mohair blend a gauge of 3 stitches = 1" on size 10-1/2 [6.5mm] needles..
Total Yardage Required: 98 (113, 135*) yds [90 (104, 124) m]. See * note above under "Yarn Used." Knitting Needles Used: Size 10 ½ [6.5 mm]: 16 - 24" [40 - 60 cm] circular needle OR straight needles (to knit first half of slipper back and forth in rows) OR SIZE TO OBTAIN GAUGE; Size 10 ½ [6.5 mm]: 1 set of 4 or 5 double-pointed needles (DPNs) OR SIZE TO OBTAIN GAUGE. I knit at an average speed, and finished these slippers the day after I started. The pattern is easy to read. I have not had the time or the weather to knit them yet but looking forward to getting out the needles when the weather cools down. These slippers were challenging yet quick easy to make. I used Red Heart Super Bulky Light & Lofty that was on sale to test the pattern. The design does not show well due to the texture and color of the yarn. Looking forward to knitting a pair in another yarn. My only complaint is when you begin the section in the round and round 7 is round 2 of the heart motif, round 8 is round 3 of the heart motif ... my poor brain! I renumbered the heart motif rounds to correspond.